A 42-year-old man who was paralyzed following a wrestling injury was able to voluntarily move his legs thanks to the new approach. In a study conducted at UCLA, five men who had been completely paralyzed were able to move their legs in a rhythmic motion thanks to a new, noninvasive procedure that stimulates the spinal cord. 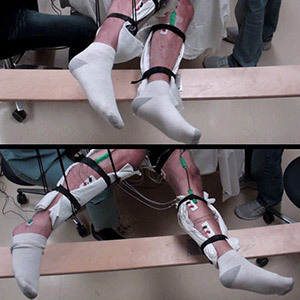 It is believed to be the first time voluntary leg movements have ever been relearned in completely paralyzed patients without surgery. The results are reported in the Journal of Neurotrauma. 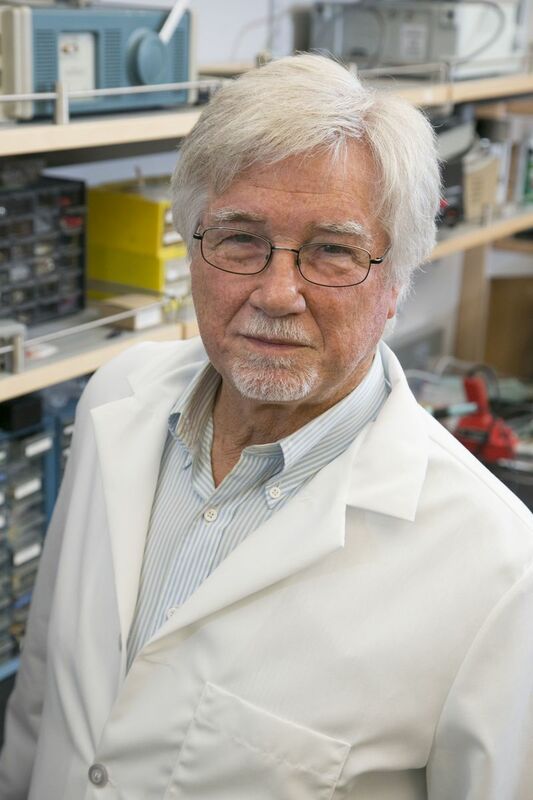 “These findings tell us we have to look at spinal cord injury in a new way,” said V. Reggie Edgerton, senior author of the research and a UCLA distinguished professor of integrative biology and physiology, neurobiology and neurosurgery. Edgerton said although it likely will be years before the new approaches are widely available, he now believes that it is possible to significantly improve quality of life for patients with severe spinal cord injuries, and to help them recover multiple body functions. Last year, Edgerton and colleagues, the University of Louisville’s Susan Harkema and Claudia Angeli and UCLA’s Yury Gerasimenko, reported that four young men who had been paralyzed for years were able to move their legs, hips, ankles and toes following epidural electrical stimulation of their spinal cords. But that procedure required that the stimulator be surgically implanted and activated — and that device remains under the skin for years. Earlier this year, a team led by Gerasimenko and Edgerton, along with Ruslan Gorodnichev of Russia’s Velikie Luky State Academy of Physical Education and Sport, demonstrated that they could induce involuntary stepping movements in healthy, uninjured people using noninvasive stimulation. The finding led Edgerton to believe the same approach could be effective for people with complete paralysis. In the new research, five men were given one 45-minute training session per week for 18 weeks. For four weeks, the men were also given twice daily doses of buspirone, a drug often used to treat anxiety disorders. Researchers placed electrodes at strategic points on the skin, at the lower back and near the tailbone and then administered a unique pattern of electrical currents. The electrical charges caused no discomfort to the patients, who were lying down. Edgerton said most experts, including himself, had assumed that people who were completely paralyzed would no longer have had neural connections across the area of the spinal cord injury. The researchers do not know yet whether patients who are completely paralyzed can be trained to fully bear their weight and walk. But he and colleagues have now published data on nine people who have regained voluntary control of their legs —four with epidural implants and five in the latest study. The men in the newest study ranged in age from 19 to 56; their injuries were suffered during athletic activities or, in one case, in an auto accident. All have been completely paralyzed for at least two years. Their identities are not being released. The research was funded by the National Institutes of Health’s National Institute of Biomedical Imaging and Bioengineering (grants U01EB15521 and R01EB007615), the Christopher and Dana Reeve Foundation, the Walkabout Foundation and the Russian Scientific Fund. Edgerton estimates that cost to patients of the new approach could be one-tenth the cost of treatment using the surgical epidural stimulator (which is also still experimental) — and, because no surgery is required, it would likely be more easily available to more patients. The study’s co-authors were Gerasimenko, who conceived the new approach and is director of the laboratory of movement physiology at Russia’s Pavlov Institute and a researcher in the UCLA department of integrative biology and physiology, as well as Daniel Lu, associate professor of neurosurgery, researchers Morteza Modaber, Roland Roy and Dimitry Sayenko, research technician Sharon Zdunowski, research scientist Parag Gad, laboratory coordinator Erika Morikawa and research assistant Piia Haakana, all of UCLA; and Adam Ferguson, assistant professor of neurological surgery at UC San Francisco. Edgerton and his research team also plan to study people who have severe, but not complete, paralysis. “They’re likely to improve even more,” he said. The scientists can only work with a small number of patients, due to limited resources, but Edgerton is optimistic that the research can benefit many others. Almost 6 million Americans live with paralysis, including nearly 1.3 million with spinal cord injuries.